Beyond the 2nd grade, most classroom teachers do not have access to specific assessment information about reading that can inform instruction. This is a big problem. However, they are rarely well-informed as to WHY their students aren’t on grade level. We give yearly, and sometimes quarterly, comprehension tests, but these assessments do not explain where the students’ reading weaknesses lie. Comprehension tests merely give an indication of a child’s overall reading ability or performance. 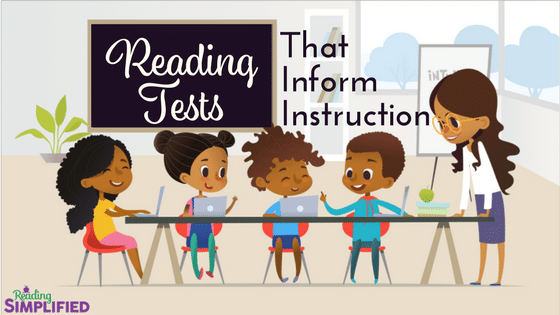 But these reading tests give almost no information to inform instruction! These and other sub-processes are all possible causes of students reading achievement struggle. But a comprehension test alone will not determine which problem, or problems, are the root trouble. Again, this is a problem. It’s like we’re sending out teachers out on the ocean near a rocky coast with no lighthouse for miles. Or, it’s like a doctor who diagnoses and prescribes on the sole information of a fever. Is the fever caused by an ear-infection? Just as we wouldn’t want to travel without a lighthouse or have a doctor who diagnoses without understanding all the symptoms, classroom teachers need more refined tools in their toolkit to solve students’ reading problems. We need fewer outcome-based tests and more diagnostic-based tests if we want teachers informed for optimal reading instruction. In this post, I will explain how 3 short tests can diagnose most students’ reading needs. I’ll also provide access to resources–including many free ones! !–that one can quickly put to use to solving students’ reading challenges. When a teacher has concerns about a child’s reading, or when an outcome-based comprehension test reveals that she is struggling, the teacher should have easy access to diagnostic measures that pinpoint the source of the problem–quickly. The #1 diagnostic test to track down the source of most reading problems in English is a nonsense word reading test. Why? A nonsense (or nonword) reading test, like the one on the right, uncovers the reader’s sound-based decoding ability. AKA, his phonological decoding ability. Strong sound-based decoding lays the foundation for all other reading skills; thus, without it, trouble with reading pops up in all sorts of places. And these troubles often get identified as comprehension problems. But, for a vast majority of students, the primary problem is simply poor sound-symbol decoding. The nonsense word test picks up this weakness because the reader can’t have seen these “words” before and previously memorized them, especially using inefficient visual approaches to word recognition. As a result, when a teacher discovers that a student has poor sound-symbol processing, she then knows that the student’s most pressing need for reading is to improve his sound-based decoding. Other reading sub-skills, such as Word Identification, Fluency, Vocabulary Knowledge, and Comprehension strategies, are still important but the urgent need for those with weak sound-based decoding is to improve sound-based decoding. All the other skills build upon, for the most part, the foundation of strong sound-symbol processing. should consider giving that test as a screener for students who are not doing well in reading. It will uncover a lot of surprising information! 99% of the students I have tutored over the last 20 years who have been identified as resistant, struggling, dyslexic, learning disabled, or Asberger’s have had poor word attack when I began tutoring them. After about 12 hours of tutoring with a focus on sound-based decoding, these students, on average, have above grade level outcomes in Word Attack. AND, their Word Identification, Fluency, and Comprehension scores go up significantly as well, usually to grade level or above. 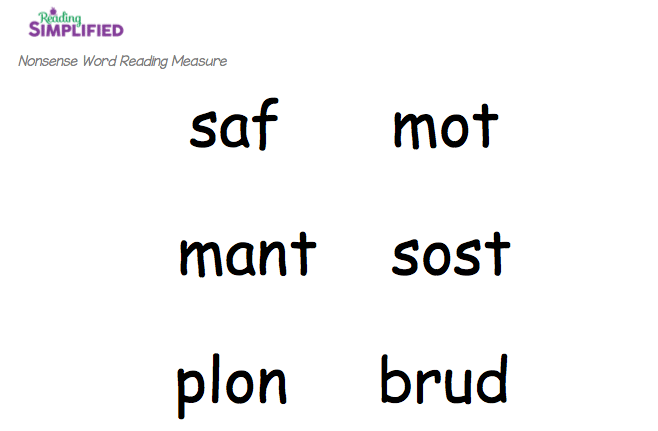 a Reading Simplified-created informal reading assessment of phonics, nonword decoding, and phonemic segmentation [download below]. The first option will give you the best estimate of how each student compares with other students. The last option doesn’t provide norm-referenced information but gives more clarity about other sub-processes, such as letter-sound knowledge, phonemic segmentation, and multisyllable decoding. While a nonsense word test or word attack test answers the question of a student’s sound-symbol processing ability, it doesn’t explain how many words a child recognizes by sight. So, a Word Identification test is a useful follow-up reading test to the nonsense word reading test. In literally just 2-5 minutes, a norm-referenced Word ID test can reveal so much about a child’s reading skills. Of course, comprehension requires a lot more than just recognizing words; however, the correlation between Word Identification and Comprehension achievement is very high–about 0.8. In other words, much of reading achievement is explained by a person’s ability to recognize words by sight. those would be excellent measures of Word ID. When those assessments are unavailable, consider using the San Diego Quick Assessment. It’s FREE! And it’s norm-referenced, so you can compare each student with a national sample of U.S. children. The testing norms are a bit out-of-date, so don’t treat it as an exact tool, but it’s an effective substitute when you have no other norm-referenced measure of Word Identification. After students have gotten a couple hundred words memorized by sight, then fluency becomes a bigger concern. Fluency, like Word Attack and Word Identification, can be assessed rather quickly. Yeah!! Once you have a student’s proximate reading level from the Word ID test, select a graded, or leveled, passage that matches her Word ID level. Thus, if you have a 4th grader with a Word ID of 3rd grade, she should read a 3rd grade passage to determine her fluency–not a 4th grade passage. Ask the student to read aloud the passage, time her, and note missed words. You want to calculate how many words she read correctly in 1 minute. The easiest way to do this is make a note of of the spot she reaches at the 1:00 mark. Count up all the words up to her 1:00 mark, subtract any missed words, and you have her words correct/ minute (WPM) for that graded passage. In addition, make a note of how fluent she sounded. How was her intonation and phrasing? If it was particularly choppy and robotic, that’s important diagnostic information for next steps. Most classrooms have some sort of graded or leveled readers that can be used for this type of fluency assessment, such as the DIBELS Oral Reading Fluency, Aimsweb CBM, Fountas and Pinnell Benchmark Assessment, or the DRA. If you don’t have access to these tools, then here are a few free, online options. ReadWorks.org is an amazing free tool of online passages–both informational and literature-based passages. It’s effective for a lot more than just passages for fluency assessments, but this can get ‘ya started. 1st – 8th grade passages from Pearson. They don’t look pretty and they’re too long, so just read a selection. However, they are likely leveled accurately. 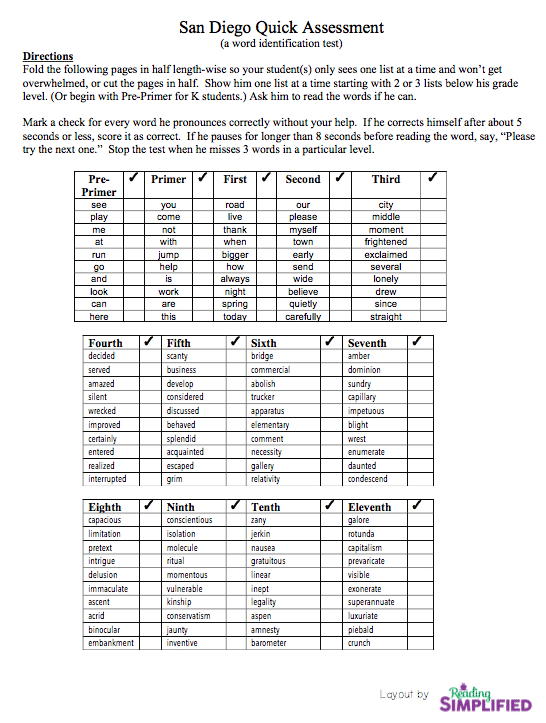 1st – 5th Grade passages from K5Learning. These passages include harder and easier passages from within each grade level, so that can be helpful to get a more precise text into each child’s hands. Over 140 passages for 1st – 5th from Mr. Nussbaum.com Afterwards, students can listen to the passages read aloud and take online quizzes, too, if that’s fun or helpful. I recommend selecting a site and using the passages from that site for all of your students for awhile so you learn to recognize the weaknesses and strengths of each passage. And you’ll gain familiarity with how well certain passages are leveled, or not. Finally, the question remains: how does a student’s reading rate relate to other children her age? 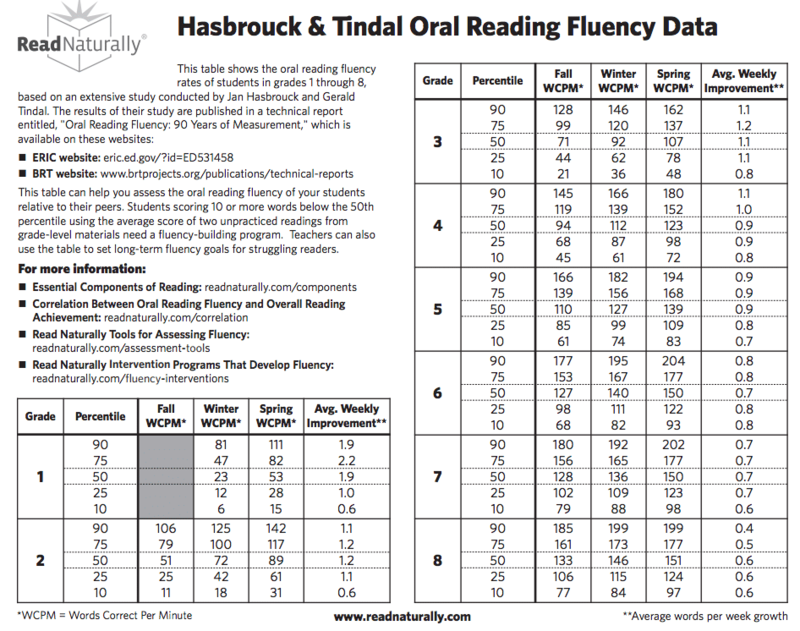 Well-known norms of oral reading rates for students K-8 have been created by Hasbrouck and Tindal. I suggest printing this out and storing it in a place you can refer to frequently. I heard Dr. Hasbrouck emphasize at a conference that fluency, in contrast to other reading skills, isn’t necessarily better at faster and faster rates. In other words, she recommends that teachers guide students to aim for the 50th percentile mark for their given grade at the relevant time of the school year. Beyond that goal, fluency probably isn’t an important goal. Spend time instead on building vocabulary knowledge and knowledge of the world through wide reading and deep conversations in books the student enjoys. Not every student needs every test. I know…you’re already over-testing, right? A general and simple framework of how reading develops should help determine which tests should be given, and when. Sound-based decoding is the foundation for other reading skills, including word identification. Word Identification usually is built upon that. The better one decodes, the easier it is for the brain to remember how words look by automatic recognition. Fluency is built on top of that word recognition skill. Thus, if a child has poor sound-based decoding and poor word identification, I’m not really concerned about his fluency for now. If I’m pressed for time, I won’t even measure his reading rate. Instead, I would focus relentlessly on his sound-based decoding skills using activities like Switch It, Read It, and Sort It, and lots of guided reading. As decoding is shored up, word identification gradually improves. Once a student has sufficient knowledge of the code and strong decoding skills, she just needs reading practice to learn to recognize more and more words by sight automatically. Similarly, fluency will follow along later after word identification, with wide reading and re-reading of short selections. Thus, most students with a reading difficulty should at least be given a nonsense word reading test to examine their sound-based decoding. In K-3, I would give all my students a nonsense word reading test, actually. Many children with strong visual memories can memorize–using mostly visual skills and limited sound-based decoding–hundreds, and even thousands, of words without strong sound-based decoding. However, eventually the visual-dominated memory taps out and these students start to dip in 3rd or 4th grade. Thus, I don’t want to ignore early high flyers who appear to be running on all cylinders but who are actually headed for a fall when they need to be able to quickly read 10’s of thousands of words to be a good reader, not just a couple thousand. Across 20 years of a somewhat-crazy-obsession with how best to teach reading, I have taught many students how to read. I’ve heard hundreds of different parents’ stories about how their child doesn’t like to read; how their child doesn’t do well in school; how their child’s teacher is concerned about reading achievement; etc. One pattern of their reading assessments, however, is not unique. Almost without fail, every student who is identified as struggling has a gap between certain higher reading skills and the lower-performing sound-based decoding, which is revealed with a nonsense word reading test. Two recent case studies were particularly striking. A high-achieving 4th grade girl was identified by her teacher as having comprehension problems because she couldn’t answer questions during class. Her mother was also concerned about attention to detail in reading, writing, and spelling. The student’s reading MAP score (a norm-referenced, standardized test) was at the 86%, which is surprisingly high for someone who appeared to have a comprehension problem. Wow! This 4th grade student was able to comprehend 7th and 8th grade material in the context of sentences and paragraphs, but in isolation, her word identification was behind grade level. Even more dramatic was the gap between her comprehension and her word attack (as measured by a nonsense word reading test)–she was performing like a 2nd grader at the beginning of the year! I was amazed that she could even do so well with comprehension with such limited sound-based decoding skills! But while her case study is dramatic in the scope of the discrepancy, it is typical of the pattern. Word Attack weaknesses are the drag on the whole reading system. After just 6 hours of instruction, her word attack went up 1.8 grade equivalents and her comprehension improved 1.1 months. By the end of tutoring of 12 hours of instruction with a focus sound-based decoding, she had improved rapidly in all reading fronts, as well as writing and classroom attention. !! I also was privileged to work with a freshman boy who had just been identified by an private psychologist as being dyslexic. He fit a pattern like the child above–word identification slightly behind grade level, but word attack significantly behind grade level. Unfortunately, he didn’t have the compensatory abilities to have above-grade level comprehension. I kept working with him but that was a big jump after just 7 sessions! To go from the 37% in Word ID to the 70% in Word ID is huge and was dependent on him reorganizing his sound-based decoding abilities. What Can a Nonsense Word Reading Test Do for Your Students? Do you have students who lack motivation to read? Those who struggle to get their ideas down on paper? Those who don’t want to read aloud? Those who seem brighter than their reading tests would suggest? Yes, a sound-based decoding ability can be easily masked through lots of practice, grit, and cleverness. Nevertheless, problems will arise related to reading, writing, or school achievement in general when a student’s decoding lags behind his grade level. How will you know what the source of your students’ reading problems unless you test them? A 2-5 minute nonsense word test is a good place to start! Please consider giving one of the free nonsense word reading tests listed above, especially one of the norm-referenced ones. If they aren’t at grade level or well above grade level (my preference), then it’s likely that they will significantly benefit from improved sound-based decoding. The good news is that boosting that isn’t as complicated or drawn-out as you might think. And please comment with your experience with these tests! Or, do you have a diagnostic question about a student or two? Your teacher colleagues and I would love to hear from you so please comment below. Hey Marnie, I have a question about the Word ID test. I have used the San Diego Assessment before and I am wondering how you read the score? If a student misses one word on the first grade list and then 4 words on the 2nd grade list, which word level would you use for instruction? Also, does the grade level of the word list indicate where students should be at the beginning of that grade level or the end? But based on your example, there’s no perfect fit, right? This is a broad brushstroke-type test, so it’s fine to use your judgement on issues like this. I would label that score array as Instructional at “Early 2nd grade” since the student is technically at Frustration with the entire 2nd grade list. However, the great 1st grade score should keep him/her out of 1st grade as Instructional. Does this fit with other data you have? Yes, that is the direction that I was going. 1st grade seemed like it would not be enough of a challenge, so we will start slow with the 2nd grade list.